Pupils from two local schools have worked with the University of Plymouth to create an eye-catching installation for this year’s Port Eliot Festival. A-level students from Lipson Co-operative Academy and Liskeard School and Community College teamed up with design students and lecturers for the project, which will be revealed when the festival opens on Friday 28 July. 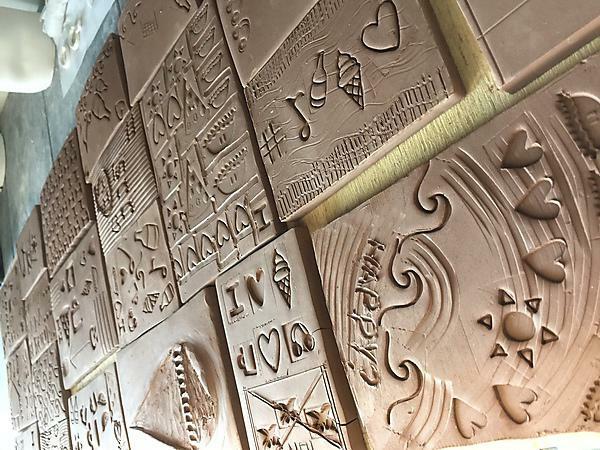 They have created message tiles which will be attached to a series of pyramid-like structures and installed at Port Eliot during the festival. Throughout the weekend, festival goers will be able to create their own message tiles to adorn and add to the iconic installation. They have also designed their own emojis, which have been modelled into stamps that festival goers will be able to use during the three-day event. The project involved Year 12 pupils from the schools, working alongside stage two 3D Design students and lecturers Jonathan Forster and Tavs Jorgensen, using the cutting edge facilities housed within the University’s Digital Learning Suite. For the third year, the University’s Faculty of Arts and Humanities is the creative and cultural partner of the Port Eliot Festival. The collaboration is coordinated by the University’s Creative Cultivator unit, which exists to nurture and support external engagement, knowledge transfer and collaborations between academia, the creative industries and wider community. Port Eliot aims to inspire and surprise as it draws an unmatchable collection of artists, musicians, writers, comedians, performers, thinkers, makers, protagonists, agitators and scribblers to one of the most beautiful corners of the country. This year’s event will run from Thursday 27 to Sunday 30 July on the rolling park and woodland of the ancient estate at St Germans, on south-east Cornwall’s Rame Peninsula. Students and academic staff will also work alongside established professionals to stage workshops in a range of craft and design practices, create a daily newspaper for the festival and collaborate with Creative Kernow to showcase the best of Cornish creativity.